Today on the blog, Ryan K. Noppen, author of Malta 1940-42, uncovers why the Regia Aeronautica (the Italian Royal Air Force) was so ill-prepared for conflict, despite it being heralded as an example of modernity by Mussolini's regime. In November 1939, two months after the beginning of World War II, an internal investigation within Italy’s air force, the Regia Aeronautica, revealed that of the total 2,802 combat aircraft in service, there were only 536 bombers and 191 fighters that could be considered modern front-line aircraft (388× Savoia-Marchetti SM.79, 148× Fiat BR.20 bombers; 143× Fiat CR.42, 19× Fiat G.50, 29× Macchi C.200 fighters), and of these only 396 bombers and 129 fighters were serviceable. This investigation, designed to determine the Regia Aeronautica’s overall war-readiness, also found that 40% of the Regia Aeronautica’s total aircraft were in a non-operational condition. With such a small number of combat-ready aircraft compared to the air force rosters of other belligerents, the Regia Aeronautica was not in a position to enter a protracted war with Britain and France across a front as broad as the Mediterranean. The results of this investigation cost the Regia Aeronautica’s commander, General Giuseppe Valle, his job and left his successor, General Francesco Pricolo, with a strategical and logistical mess. This was a very different picture of the Regia Aeronautica to that portrayed by the frequent mass aerial displays and public demonstrations throughout the 1930s, which were designed not only to impress Italy’s population but also to intimidate its neighbors and international rivals. Despite the Regia Aeronautica’s dangerous state of unpreparedness, Italy’s Duce, Benito Mussolini, was eager to expand his fascist empire at the expense of the other Mediterranean powers and pressed his air force to prepare for war throughout the first half of 1940. So why was the Regia Aeronautica, heralded as a tangible example of fascist modernity by Mussolini’s regime, so ill-prepared for conflict after years of Italian rearmament? While there are many answers to this question, several of the most important reasons can be attributed to the policies of Mussolini’s government. First, the Regia Aeronautica suffered from the inefficient and oligopolistic state of the Italian armaments industry, a situation purposely fostered by the fascist state. In 1932 several large Italian banks and investment concerns faced bankruptcy, having bought out many of the nation’s struggling industries since the start of the Great Depression. The following year Mussolini’s government founded the Istituto per la Ricostruzione Industriale (Institute for Industrial Reconstruction) or IRI, a state-sponsored holding company that bailed out and took control over the nation’s failing industries. As the majority of Italy’s industrial firms now became partially or fully state-owned enterprises, the state assumed a massive financial burden just before embarking on Mussolini’s mid-1930s military build-up. The government did not closely monitor the financial operations of these firms, as its primary interest was keeping Italian workers employed. Mussolini greatly feared labour unrest throughout his rule, as it was the labour violence of the Biennio Rosso (Two Red Years) of 1919–20 that he and his fascists fought against before taking power in 1922. What this meant for the air force, as well as the other armed services, was that they were forced to parcel out contracts for arms and equipment to multiple manufacturers in order to keep Italian workers gainfully employed. This resulted in a large number of different types of aircraft from different manufacturers and thus a wide variety of engines, parts, supplies, etc. It was a logistical nightmare. High tariffs and the ability of state-owned enterprises to control prices resulted in high price tags for aircraft, limiting the number which the air force could purchase. This situation was further exacerbated by Mussolini’s decision in 1936 to push for Italian self-sufficiency in strategic material acquisition and production, raising the cost of domestic industrial production even higher, an overreaction to the paltry international sanctions placed on Italy during the Second Abyssinian War. Italy and its empire had no domestic petroleum deposits and only minimal iron ore, coal, and other strategic metal deposits; it was impossible for the steel and armaments industry to be independent from foreign natural resources. Large sums were wasted on developing ersatz resource alternatives that could be produced in Italy, and as the rest of the world rearmed throughout the 1930s, the cost of imported strategic materials increased with worldwide demand. The cost of imported strategic materials was of little consequence to the state-sponsored armaments manufacturers as they simply raised the price tags of their products; government price control of armaments was virtually non-existent. With immunity from bankruptcy, guaranteed contracts, little fear of competition, and minimal organizational control from the state, state-sponsored armaments manufacturers also felt little need to invest in research and design or improve and modernize their construction and output methods. Lack of investment into modern mass production techniques, as well as failure to invest in workforce training, resulted in frustratingly slow production times. While not under the control of the IRI, Fiat was perhaps the worst offender of the previously described industrial circumstances. Throughout his rule, Mussolini had favoured Italy’s largest industrial concern, protecting it against foreign competition. As the firm was one of the nation’s largest employers, Fiat’s directors, some of whom were also members of the government, learned to manipulate Mussolini’s fears of industrial unrest to the firm’s advantage, to the extent that it was able to produce some of the most obsolete and poor-quality materiel of World War II. A second reason for the Regia Aeronautica’s poor state of readiness in late 1939 was the general unreliability of Italian aircraft engines, an inescapable problem that would plague Italian aircraft development and would dictate Regia Aeronautica aircraft selection in the years leading up to World War II. During the 1920s and early 1930s Italian aircraft engine manufacturers continued to produce modular inline engines in which the cylinders were separated, each with their own casing; this resulted in heavier engines as well as longer, costlier production compared to cast-block engines, which had been introduced abroad in the mid-1920s. The engine manufacturers refused to retool their lines for cast-block construction – having no incentive to, given Mussolini’s insistence on subsidizing domestic industry without regard to quality control – but by 1933 the technical limits of modular inline design had been reached. General Italo Balbo, then commander of the Regia Aeronautica, made the radical decision to require that all subsequent Italian military aircraft designs be powered by radial engines, which at the time had a higher power-to-weight ratio and were viewed as more reliable. Italian manufacturers had little prior experience with radial engine design and construction, and neither were they willing to invest in a lengthy research and design process. To expedite the switch to radials Italian manufacturers purchased licenses from foreign manufacturers such as Bristol, Pratt & Whitney, and Gnome-Rhône. The licences acquired tended to be for older engines so Italian manufacturers altered the designs in a bid for more power. But the Italian engineers attempted to lengthen the stroke of these radials merely by lengthening the cylinder bore and without altering the original cylinder heads, pistons, and valves – in short, attempting to obtain greater engine displacement without having to design new engine parts. As the original engines were not designed to cope with the increased speed, torque, and stress, the altered engines were prone to overheating and failure. One of the Fiat BR.20 bombers sent to Spain as part of the Italian Aviazione Legionaria. From 1936–39 almost 300 modern, frontline Italian aircraft were sent to aid Francisco Franco’s Nationalists. The problems with the modified engines were exacerbated by the inferior-quality materials going into the steel alloys from which the engines were cast. The Italian petrochemical industry also failed to adopt the alkylation process used abroad for creating higher-octane aviation fuel, resulting in lower power output. Many Italian-produced lubricants used for aero engines were vegetable-based rather than mineral-based and were not stable enough to adequately protect fast-moving engine parts from hard wear. All of these subsequent problems were caused by Mussolini’s insistence on strategic material self-sufficiency. Furthermore the air force did not have enough trained mechanics capable of servicing aircraft engines. The Regia Aeronautica generally had insufficient numbers of air crews and trained personnel, but it particularly lacked ground and maintenance personnel with technical specialties, largely due to lack of funds for adequate training and the fact that there were relatively few mechanically and technically trained individuals in the civilian workforce, compared to other industrialized nations. Mussolini’s state had largely failed to alter the largely agrarian nature of Italy’s population and economy. Another explanation for the shortage of modern fighters and bombers in late 1939 was the fact that a large number of Italian-made combat aircraft had been sent abroad in the late 1930s. Mussolini’s intervention on the Nationalist side in the Spanish Civil War was one reason for this. From the summer of 1936 to the spring of 1939, the Italian government sold or gave General Francisco Franco’s Arma de Aviación over 200 aircraft, and sent an additional 764 aircraft to serve with the Regia Aeronautica in Spain. Many of these were taken out of Regia Aeronautica stocks. Modern aircraft types which the Regia Aeronautica could have used by the end of 1940 had been sold or sent to Spain, including 11× Fiat G.50, 13× Fiat BR.20, 23× Breda Ba.65, and 84× Savoia-Marchetti SM.81. Particularly important was the transfer to Spain of 153× Savoia-Marchetti SM.79 bombers, which amounted to roughly 30% of all SM.79 production up to September 1939. While roughly half the fleet sent to Spain were Fiat CR.32 fighters, largely ineffective by 1940, the diversion of so many aircraft to aid Franco kept the CR.32 (and other older types) in production much longer than they should have been, in order to meet other contracts and replenish depleted Regia Aeronautica rosters. This held up the production of more modern types. Italian manufacturers refused to change Regia Aeronautica contracts of aircraft sent to Spain to newer-model production. In addition to the aircraft sent to Spain, the Regia Aeronautica suffered from the loss of spare parts and supplies, drawn from Regia Aeronautica stores, to keep the Spanish aircraft operational. 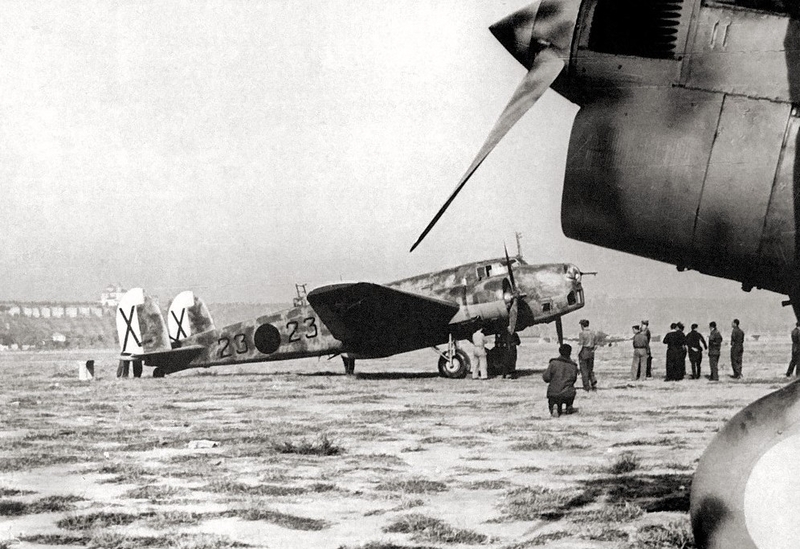 Finally, at the end of the conflict, the Aviazione Legionaria left its surviving aircraft to Franco’s air force, Mussolini claiming that the cost of bringing the aircraft back to Italy was too high. Large numbers of Italian-made aircraft were also sold and exported in the years leading up to the war. By 1937 the bailout of Italian industry, the push for strategic self-sufficiency, and continued increases in military spending (by 1940 it was 80% that of Great Britain’s, while Italy’s national income remained at only around 25% of Britain’s). Foreign currency reserves were so low that Mussolini’s government began selling large quantities of modern military equipment, including aircraft, to foreign buyers, in return for hard currency and strategic resources needed in Italy – oil, iron, various types of steel, copper, nickel, machine tools, industrial diamonds, rubber, and even foodstuffs. Between 1937 and 1939, the government-organized Consorzio Italiano Esportazioni Aeronautiche, or Italian Consortium of Aeronautical Exports, exported 925 aircraft abroad. Despite Mussolini’s renewed rearmament drive following the outbreak of World War II, he increased the amount of military exports in early 1940 due to the increasing cost of desperately needed strategic resources, caused by the British blockade and the German war on Allied seaborne commerce, compounded by heightened British, French, and German needs for raw materials. An additional 332 aircraft were sold abroad in 1940 (with production taking place in 1940–41). Excluding the aircraft sold or given to Franco’s Nationalists, modern fighter and bomber exports from 1937 to 1940 included 79× Savoia-Marchetti SM.79s, 82× Fiat BR.20s, 171× Fiat CR.42s, 35× Fiat G.50s, and 130× Reggiane Re.2000s. 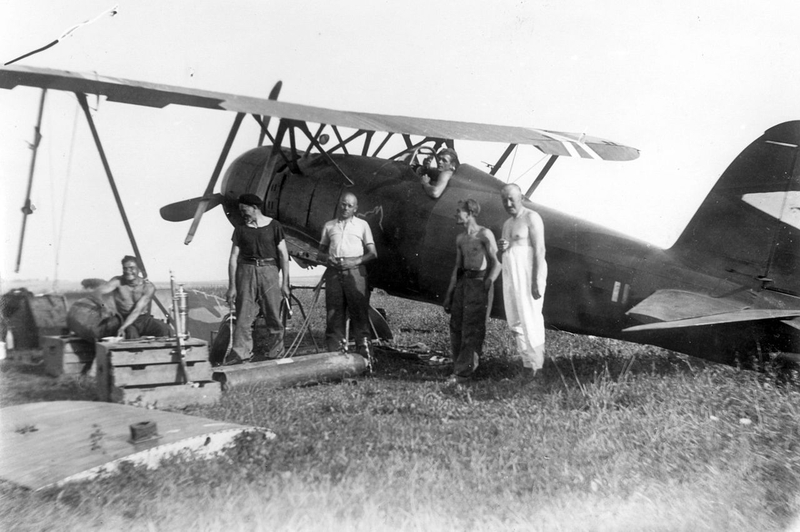 Hungarian Fiat CR.42 undergoing maintenance in the field. A total of 171 CR.42s, produced in Italy and which could have gone into Regia Aeronautica service, were sold abroad in 1939–1940. Even as Mussolini looked for a way to bring Italy into the war in spring 1940, the desperate need for hard currency and strategic goods made him initially approve export orders of 12 Macchi C.200 fighters to Denmark and, shockingly, 300× Caproni Ca. 313 reconnaissance bombers, 100× Ca. 311 trainers, and 300× Re.2000 fighters to Britain – the nation Mussolini hoped to soon be at war with! Given the small number of modern fighters and bombers actually in Italian service in November 1939, the dispersal and export of modern combat aircraft to foreign ventures and customers had a direct effect on the combat readiness of the Regia Aeronautica when World War II began. Given the mess that was inherited from Valle, the external demands of foreign intervention and export sales forced by Mussolini’s financial advisors, and the disorganization and corruption in the aero industry, there was little Pricolo could do to immediately improve the Regia Aeronautica’s operational readiness and effectiveness, as well as its combat strength. When Pricolo reported the actual state of the Regia Aeronautica to Mussolini in December 1939, Mussolini did not seem overly concerned and told the air force commander: “Pricolo, don’t take things too hard, we’ll fix them together.” Amazingly, by June 1940 when Italy entered the war, Pricolo had increased the number of modern bombers and fighters to 900 and 574 respectively, but only 573 bombers and 368 fighters across the entire Mediterranean basin were then considered operational – again, not enough for a protracted war against the British and the French. However Mussolini, knowing full well the overall unprepared state of the Regia Aeronautica and other armed services, entered the war on a strategic gamble; with the Allies in full retreat along the front in the West, he believed the end of the war was in sight. 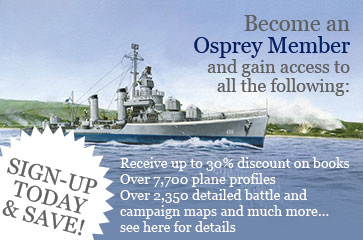 Mussolini’s opportunistic strategy for acquiring British and French territory in the Mediterranean is best summarized in his own words to General Pietro Badoglio, Capo di Stato Maggiore Generale or Chief of Staff of the Armed Forces, on May 26, 1940: “I assure you the war will be over in September, and that I need a few thousand dead so as to be able to attend the peace conference as a belligerent.” Events would show that Mussolini’s gamble was poorly played and that the Regia Aeronautica, with almost half of its strength grounded when Italy entered the war, was ill-equipped to adapt to the lengthy campaigns that would be fought across the breadth of the Mediterranean and beyond. As it turned out, the Regia Aeronautica was not in a position even to subdue a threat close to home, let alone threats from across the Mediterranean. The island of Malta, a strategic objective of Italian pre-war military planning, was unable to be subdued from the air during more than two years of aerial bombardment, first by the Regia Aeronautica and then by the German Luftwaffe. 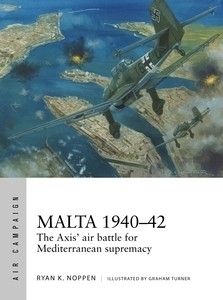 To learn more purchase Osprey’s latest Air Campaign title, Malta 1940-42: The Axis’ Air Battle for Mediterranean Supremacy by Ryan K. Noppen today. None of the Reggiane or Caproni aircraft negotiated for by the RAF in 1940 were purchased or delivered. There is a photo of a Caproni Ca.311 in RAF colors but the particular aircraft in question was captured by the British at Foggia in 1943 and photographed at the same airfield in November of that year. The Czech model company Special Hobby released a 1/72 Caproni Ca.311 kit (Special Hobby SH72313) several years ago which includes decals and painting instructions for this aircraft in its RAF color scheme. Kuvaszsleepybear - No, the planes were never delivered to the RAF. All orders were cancelled in June 1940 after Italy's entry into the war. Five Ca 313s were however delivered to France prior to Italy's attack on them - they'd also been selling to them as well as us. Did they actually deliver the planes to Britain and if so where were they used.Any pictures of them in RAF colours on a website somewhere? Thank you for an excellent article, Mr Knoppen. I had not realised that Mussolini was selling aircraft right up to the entry of Italy into WW2.